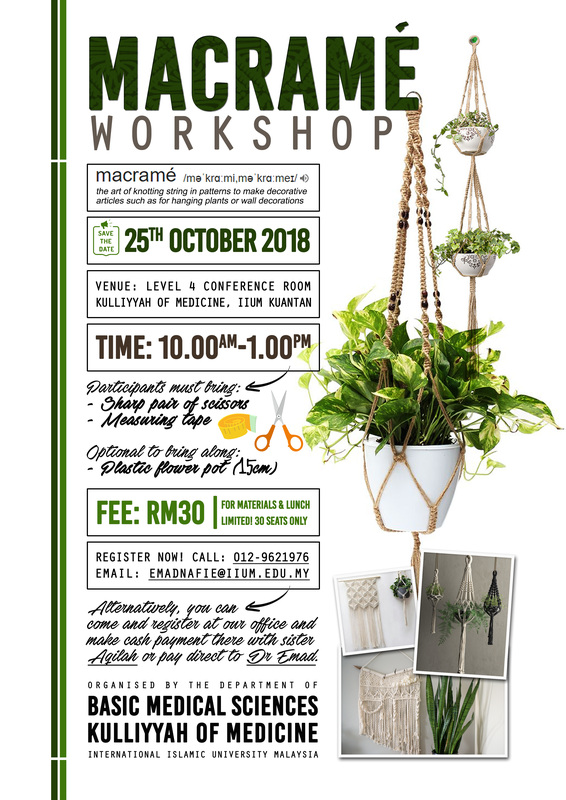 INVITATION TO ATTEND MACRAME WORKSHOP 2018 organised by Department of BMS, Kulliyyah of Medicine. Very limited seats (30 only). Register now! Call: Assoc. Prof. Dr. Emad Nafie (012-9621976) or email him at emadnafie@iium.edu.my. Alternatively, you can come register for the workshop at our office (Level 2 KOM, use the rear entrance - from the library and KOD) with Sr. Aqilah. Payment can be made by cash to her as well.